In our third and last installment of the 2013 senior snapshots we focus on three projects from seniors of the Albert Nerken School of Engineering. (See our two previous snapshots from the schools of art and architecture.) As one would expect of one of the most rigorous and exclusive undergraduate engineering schools in the country, these projects go beyond the quotidian and provide a peek into the engineering solutions of the future. For their senior project Christopher Hong, Mihir Patel, and William Ho, graduating electrical engineering students, took a white-hot technology used by the likes of the Samsung Galaxy S4 smartphone and made it even better, winning first prize at the Annual IEEE Student Design Competition at the Rochester Institute of Technology. "It's an eye gaze tracking device that can work with multiple people at long distances, is low-cost, non-obtrusive and works in real time," Hong says. In other words, they have untethered the technology from being single-user and requiring a very close proximity to work. To do it, they took an inexpensive, consumer grade web camera and stuck it behind infrared LEDs. 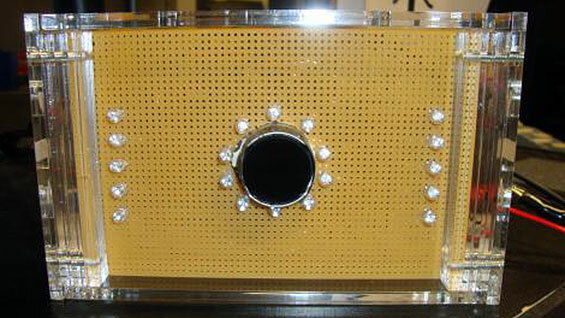 A custom-built circuit synchronizes the camera and LEDs, capturing two different pictures at 15 frames a second. "One of the pictures has the red-eye effect caused by the infrared LED around the camera," Hong says, "Then the dark eye image, a picture without infrared bouncing off your eyes, is captured. We subtract them and obtain the location of your eyes. We then calibrate on one point and as your eyes move around the system computes the point of gaze." "There are many, many applications" for the technology, Hong says. By way of demonstration, they developed an advertising application for looking at a screen full of Cooper Union club posters. The poster looked at by the most people at once would expand to fit the entire screen. Other uses Hong suggests include computer accessibility for the handicapped, monitoring classroom attention, and testing babies for visual disorders. Right now the device works with multiple users up to seven feet away and has an accuracy of plus or minus six inches, but both of those can be improved with further development, Hong says. The project won First Place in the 13th Annual IEEE Student Design Competition at the Rochester Institute of Technology earlier this month. The competition, which saw entrants from Asia and Canada as well as the U.S., requires entrants to include a public demonstration, much like a science fair. The Cooper table drew a crowd. "We had hundreds of people walk up to us," Hong says. "Many asked if we had been approached by a company to further this project." After graduation Christopher Hong will be working on getting his Masters at Cooper while working as a software developer for Bloomberg LLP. Patel and Ho will be working at The Hackerati and The Rubenstein Technology Group, respectively. Hong also intends to research a bit into patent law in the hopes of further refining the "Eye See" project. If patentable, he and his group would gladly share the rights with Cooper Union. "Looking back through my papers over the past few years made me really appreciate how lucky I was to be at Cooper Union," Hong says. "It's a really priceless experience. In the future I want to make sure other students have the same Cooper experience that I did." Big things like subways, buildings and bridges have long fascinated John Alvizuri, born in Peru but raised in Flushing, Queens. So it comes as no surprise he graduates this year from the civil engineering program. That interest has guided his work as a senior to New York's massive Jacob Javits Center. In a joint effort with Drexel University, Cooper's engineering students, including Alvizuri, will be gathering environmental data from the Javitz Center's newly installed green roof, the second largest in the country. "It's a nice tie-in to how we are trying to be environmentally-friendly by trying find ways to improve things in a very infrastructure civil-engineering-based way," Alvizuri says. Working with civil engineering professor Dr. Joseph Cataldo, Alvizuri proposes to build a drainage system below the Javits' green roof that will allow him to accurately measure the water run-off during storms. "Not to reclaim it but to compare it to how much water flows off of concrete or asphalt," Alvizuri says. "It's a measure of how successful the green roof is in trying to retain storm water. This is important because we are trying to alleviate our combined sewer systems that mix storm water runoff and the sewer system. So that's an infrastructure problem in which a solution proposed includes using green roofs as storm water mitigation." Alvizuri, who says with a grin that his four years at Cooper are like ten years at another school, will return here to complete a Masters program. 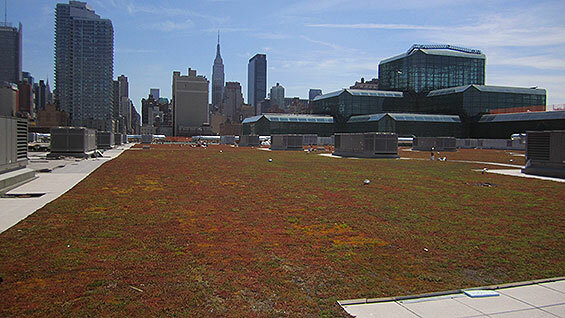 His thesis will include data he hopes to gather from the Javits' green roof after submitting a proposal over the summer. As part of that work he has had the good fortune to visit the roof, though it is not open to the public. "When you are on the green roof it feels like you are on street level, in a park, even though you are on top of a roof," he says, wondering at the immensity of it. The work of Byron Smith and his fellow chemical engineering seniors, Jenn Guia and Samjit Walia, likewise focused on sustainability. 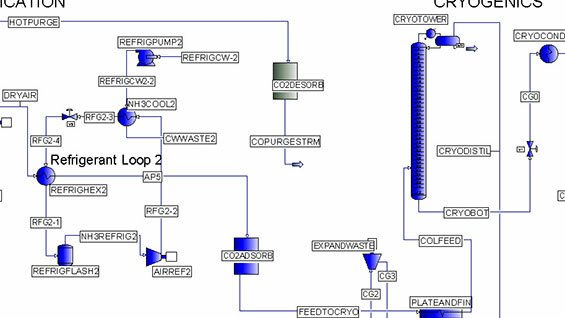 They were tasked with designing a "green" ammonia plant from scratch. Ammonia, made up of nitrogen and hydrogen (NH3), may have an unpleasant smell but it is the key "precursor" to fertilizer as well as other nitrogen-based chemicals. Worldwide production is about 130 million metric tons a year, according to Smith. Most typically, he says, ammonia production involves digging up coal or natural gas and converting it in a process that also produces carbon dioxide, a contributor to the greenhouse effect. Smith's group focused on altering both the method of production and the use of the product. Their conclusions were surprising. First the method: Smith's group proposed collecting the nitrogen in a fairly standard way, by liquefying air and distilling it into its component parts. The hydrogen would come from municipal water that, after being filtered, would be electrolyzed, pulling it apart into hydrogen and oxygen, a method not currently used in commercial ammonia production. "So in what ends up being like five acres of big, several-ton electrolysis units you run about 170 megawatts of power that comes from a 200 megawatt solar plant which can be built in the Arizona desert," Smith says. "Our plant produces no greenhouse gas emissions because the energy all comes from solar power and nothing generates CO2 in the process." Once that ammonia is produced, using standard methods, Smith's group explored an alternative, sustainably minded use for it. "The idea is to make the ammonia so that it can be used as a consumer fuel," Smith says. "It can be converted into hydrogen for hydrogen fuel cells at charging stations or just burned directly." But, he says, "our conclusion is that this plant represents an economic and environmental failure and we do not recommend its construction. One of the troubles with this project is that it is about three times more expensive than just digging up natural gas and turning it into ammonia." Also, he says, "Our initial assessment of ammonia as a fuel is dubious." He estimates that to replace just five percent of the world's diesel and gasoline consumption with ammonia would roughly double the current ammonia production capacity. "You would have fuels competing with the major precursor to what makes food. I think it would cause significantly worse food price increases than what we have from corn ethanol." In spite of his conclusions, Smith says he found the project "really interesting" and a useful synthesis of all his chemical engineering knowledge. Asked about his Cooper Union experience Smith, who will return next year to work on his Masters degree, pauses a moment and answers thoughtfully. "The value of Cooper has over and over been shown to me to be my classmates. What makes the classroom experience really valuable is that the room is full of really bright people who can contribute novel, interesting ways of thinking to the projects we are working on."